Using multimedia communication is essential when trying to reach your customers. Living in Orlando, I see many companies, large and small, who are using multimedia communication to integrate their marketing effectively. This video shows a great example of a small business using multimedia communication effectively to build business. In today’s multitasking digital landscape where it takes more touches to reach a customer, combining things like radio, TV, print, social media, web, email, and more will get your message to more people. I wanted to highlight a local organization that has used multimedia communication extremely effectively to meet their goals and grow their company. I have personally seen their very active Facebook and Twitter pages, billboards, newspaper ads, email blasts, items handed out, and much more! Orlando City Soccer is a great example of using multimedia communication to help grow your business and increase brand loyalty. 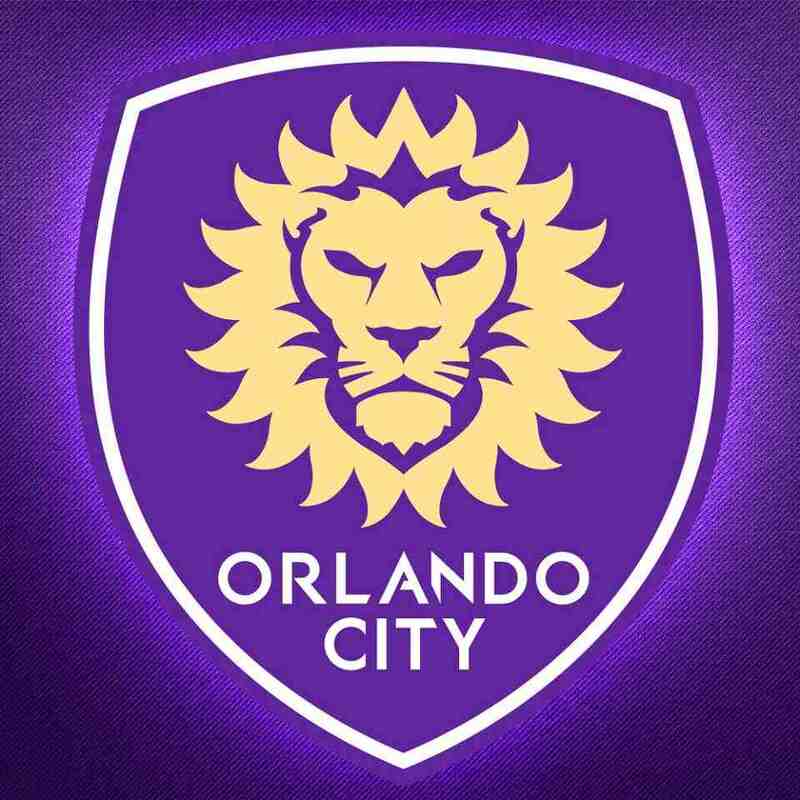 Orlando City Soccer Club (OCSC) was founded in 2010. What began as the Austin Aztec FC in 2008 moved to Orlando with high hopes of becoming a Major League Soccer (MLS) expansion team. Being a huge soccer fan, I was immediately excited. After attending some matches during the inaugural season, I purchased season tickets. With the desire to become an expansion team in the MLS, Orlando City SC has done a tremendous job at showing their organization to be vital to the fans and the community. As a season ticket holder, I was put on an email list and receive emails directly from the club. This is a great tool to keep in touch with customers. While I don’t read all of the emails, I do read them regularly. A good subject line is certain to get my attention. I’ve also received direct mail containing things like schedules, coupons, and flyers for special events. One notable piece of print is their pocket schedule that folds and goes conveniently into your wallet. They even included a few to share with friends. During the 2013 season, OCSC had flags of their players hanging from the lampposts in Downtown Orlando, and more notably, when MLS commissioner Don Garber came to visit Orlando in 2012 to take a look at the city as a possible option for an MLS expansion team, Orlando City Soccer rolled out the red carpet, and showcased their brand. They put an ad in the local newspaper, the Orlando Sentinel. My favorite thing they did was the series of digital billboard ads they produced, even incorporating social media by using fans’ tweets directly in some of the ads. OCSC has a very active social media presence. They are extremely active on Facebook, Twitter, Instagram, YouTube, and Pinterest. One engaging campaign was Scarves Around the World. Orlando City asked fans to take photos of themselves holding the Lions’ scarf when they traveled around the world. These were then pinned, retweeted, tagged, and favorited on Instagram, Pinterest, Facebook, and Twitter. It was a hugely engaging thing for fans to focus on in the off-season. Orlando City Soccer Club also gives away items to fans and ticket-holders. 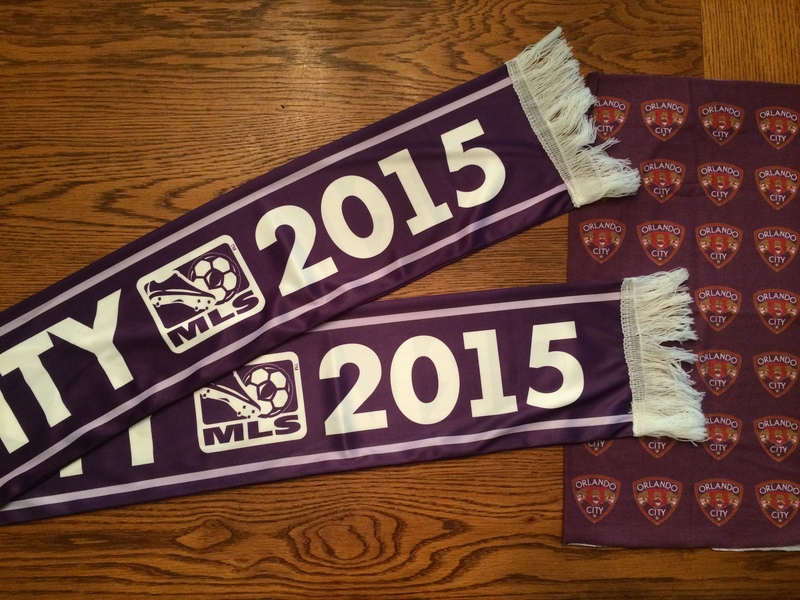 2014 season ticket holders received the 2015 scarf pictured below. They’ve also given away head-wraps to fans as they enter the stadium, branding them upon entrance. OCSC also works with corporate sponsors to give-away items at the stadium upon entrance. Also pictured are various coupons and spirit-gear to help fans enjoy the match and remember the brand after. Their brand voice is in-your-face and playful and the tone is direct. 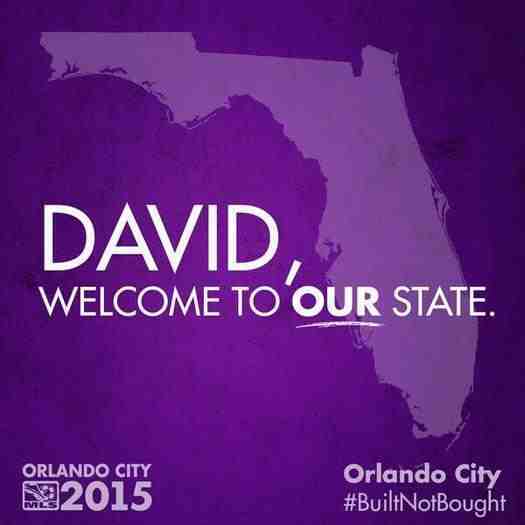 Using the hashtag, #BuiltNotBought, OCSC showed their social media savvy. They had used hashtags before when building the momentum these photos refer to during their campaign to receive an MLS expansion team. 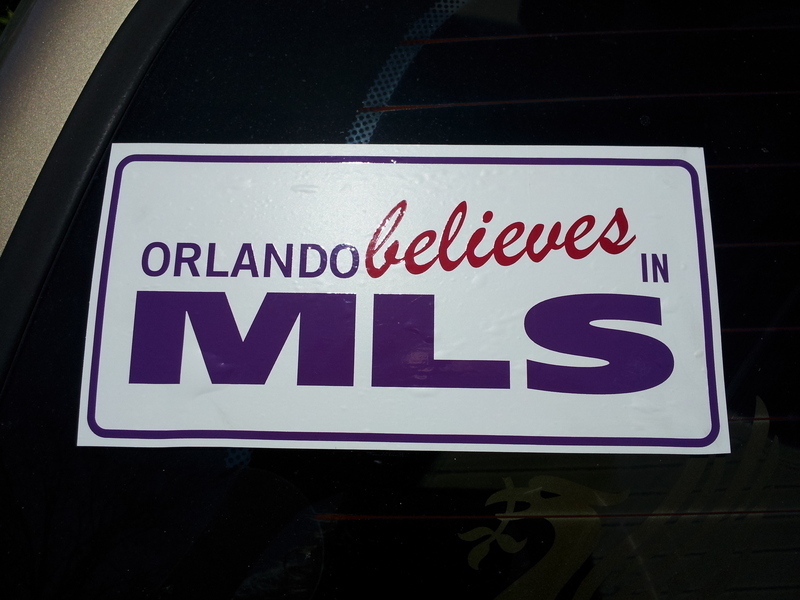 #OrlandoBelievesInMLS was one that they used on Twitter and Facebook. They also made YouTube videos, encouraging fans to sign a petition on their website and contact their representatives in Tallahassee. They even distributed bumper-stickers, showcasing yet another example of integrated marketing. 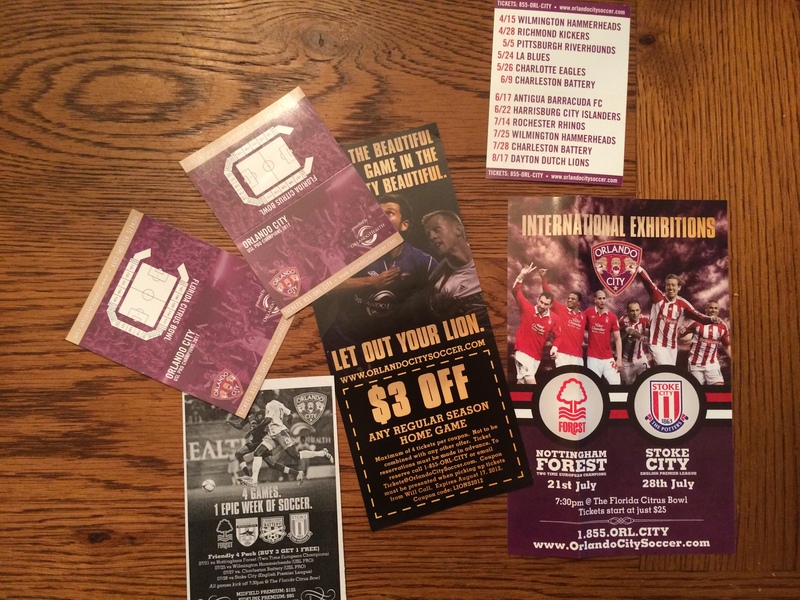 These are just a few of the vast and various examples of the way Orlando City Soccer Club uses multimedia communications. Laying this groundwork was essential when they changed their logo last month. They got some free press when the local news covered their #PaintTheCityPurple campaign. 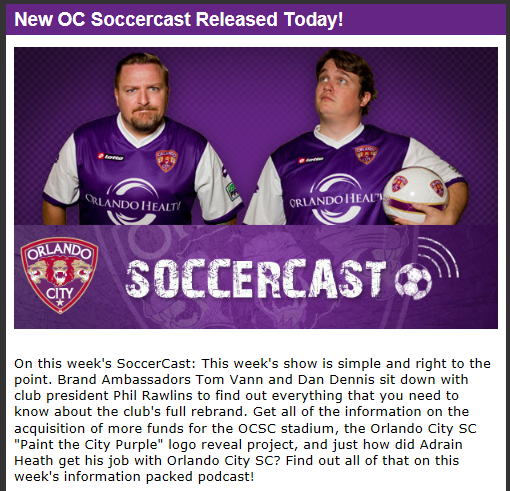 So, let Orlando City Soccer’s use of multimedia communication in building their brand be a lesson to all of us. Integrated marketing is an essential tool to any business. Reaching your target audience in multiple ways on multiple channels, gives you the best chance of strengthening your brand and engaging with customers. Hi Ann Marie, I just wanted to let you know that I’d stopped by to read your blog. Great images and I love that you highlighted how the organization integrates social media into their billboards by posting fans’ tweets! Brilliant! Thanks so much for ‘stopping by’ and commenting! The more I experience their brand, the more I see them using integrated marketing effectively.